Lil' Bits "Flower Shoppe" provides you with many more finished and separate elements that are NOT included in the FQB "Flower Shoppe" Collection. The wordart and flower stake words are are just some of the items that you will want to have a look at as these make creating so much easier.....just add them to your cards and layouts for a wonderful and elegant look! 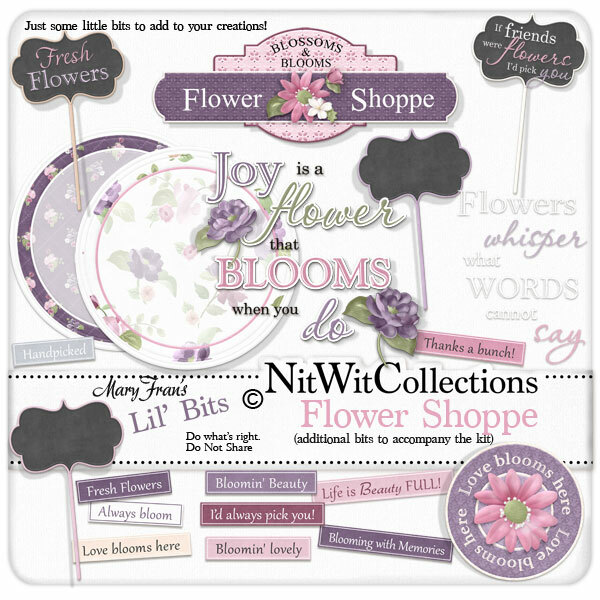 These digital elements are NOT included in the FQB "Flower Shoppe" Collection so don't pass these by! 1 Flowerstake words - "Fresh Flowers"
1 Flowerstake words - "If Friends were Flowers....."
1 Flowerstake words - "Flowers whisper...."
1 Label - "Love Blooms Here"
1 Sign - "Flower Shoppe"